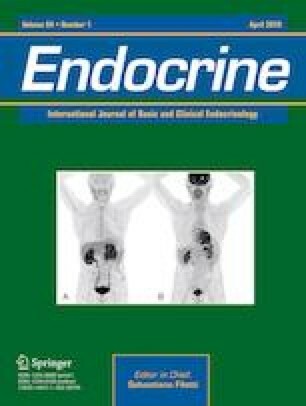 We read with great interest the article written by Lim et al. . (Hormonal aggressiveness according to the expression of cellular markers in corticotroph adenomas; Endocrine, 24 Nov 2018. https://doi.org/10.1007/s12020-018-1815-x.). Since the associations between the expressions of cellular markers of corticotroph adenomas and the hormone levels in patients with Cushing’s Disease (CD) were not clear, the authors investigated the associations between these indices and found that although pituitary tumor-transforming gene 1 (PTTG1) and Ki-67 were highly expressed compared with other markers in tumor tissue, they did not reflect hormone levels. On the contrary, the expressions of cyclin D1, p27, and brahma related-gene 1 (Brg1) had better correlations with hormone levels. This article gives us a fresh view of the predictive function of tumor cellular markers to hormone levels in patients with CD, but some points need to be addressed. J. S. Lim, M. K. Lee, E. Choi, N. Hong, I. Jee S, S. H. Kim, E. J. Lee, Hormonal aggressiveness according to the expression of cellular markers in corticotroph adenomas. Endocrine (2018). https://doi.org/10.1007/s12020-018-1815-x. O. Ragnarsson, D. S. Olsson, E. Papakokkinou, D. Chantzichristos, P. Dahlqvist, E. Segerstedt, T. Olsson, M. Petersson, K. Berinder, S. Bensing, C. Höybye, B. Edén-Engström, P. Burman, L. Bonelli, C. Follin, D. Petranek, E. M. Erfurth, J. Wahlberg, B. Ekman, A. K. Åkerman, E. Schwarcz, I. L. Bryngelsson, G. Johannsson, Overall and disease-specific mortality in patients with Cushing’s disease: a Swedish nationwide study. J. Clin. Endocrinol. Metab. (2019). https://doi.org/10.1210/jc.2018-02524.